I wrote about Brian Piana's podcast, Spill Some Stuff, earlier this year, and now I have the pleasure of being a guest on it. He wanted to talk about art fairs. We started by talking about Frieze and the smaller satellite fairs in New York and compared those fairs to the two we have in Houston, the Texas Contemporary Art Fair and the Houston Fine Art Fair. We discuss a lot of specific artworks (Jonathan Monk gets a lot of ribbing), and close with a brief discussion of an art fair that I'd like to see in Houston. When Brian Piana decides to engage in a new hobby, he goes whole hog. This was evident in the excellent home-brewed beer he served me, and in the podcast set-up he uses. 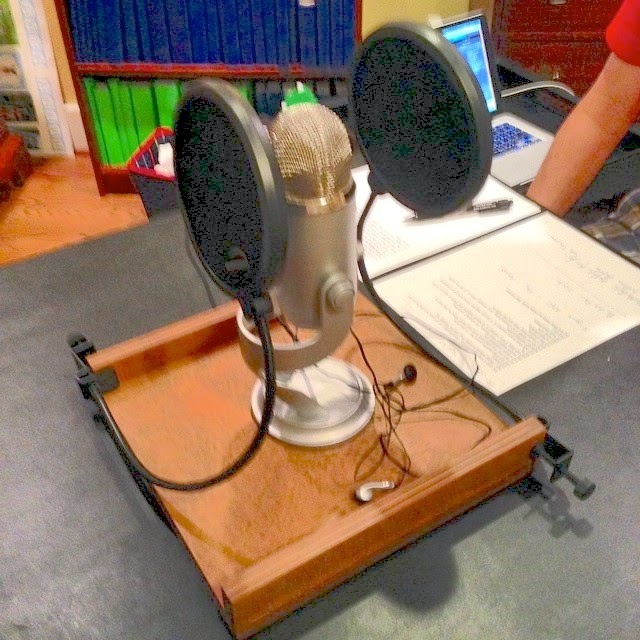 It consists a large chrome-plated microphone (that looked like it could have been used in radio broadcasts from the 1940s) mounted onto a wood plank, with two microphone screens on flexible necks between us and the microphone. Visually, it was amazing! This was sitting on a small table. I sat on one side and Brian was on the other. He was monitoring the recording on a computer screen as we spoke. And all this set up paid off--the interview sounds great. You know how when you hear your own recorded voice, it usually sounds really weird? At least for me, it never sounds right. Up until now, I've always assumed that had to do with the way we hear our own voices. But now I wonder if that's true. I was amazed at hearing my own voice on Piana's podcast--it sounded natural. It didn't have that "off" sound that recordings of my own voice usually have. Even though I managed not to sound completely dreadful, Piana as always sounds great. KUHF should give him an hour every week to chat with whoever he likes. (Of course, it's hard for me to be completely unbiased about a full hour of me spouting off on this and that. Because obviously it's great.) Anyway, Spill Some Stuff won't exclusively deal with art in the future, but so far it has really had some great local Houston art content. Give it a listen.